Access the mydlink™ service quickly and easily from anywhere to control and monitor your home network by downloading the free mydlink™ Lite App from the Apple iTunes Store or Android Market. View what devices are on your home network and what sites are being visited, which is great for parents. Follow the instructions of the easy setup wizard to create a secure wireless network, and be online in minutes. 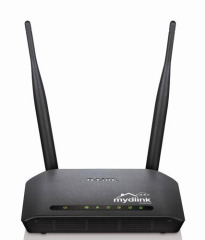 The D-Link Cloud Router creates a fast home network for sharing broadband Internet, sharing files and more. Wireless N technology offers more speed, extended coverage and virtually no dead spots while still being compatible with previous wireless network standards. This router transfers data at speeds of up to 300Mbps1. Setting up your network is simple with secure WPA™ or WPA2™ encryption using the Wi-Fi Protected Setup™ (WPS) button. It uses Intelligent Antenna technology to transmit multiple streams of data by bouncing multiple wireless signals off of walls enabling you to receive wireless signals in the farthest corners of your home1.